In calm rhyming couplets, the author describes heaven as “hearing the stories you tell us / and thinking that you’re ever so clever. / It’s something we do that we made up ourselves, / like rubbing our noses together.” Andreae is the creator of Purple Ronnie, a popular British cartoon character. His previous books include Rumble in the Jungle and Pants, which won the U.K.‘s Red House Picture Book Award and the Stockport Picture Book Award. All together, his children’s books have sold more than 1.5 million copies. The illustrator, who currently lives in England but grew up in several countries ranging from Belgium to Zaire, has been short listed for the Sheffield Children’s Book Award, for The Magic Donkey Ride, written by Andreae. 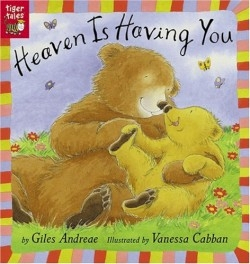 Here, the pictures are bright and warm, similar to Cabban’s golden illustrations for Love is a Handful of Honey, an earlier collaboration of the author and illustrator. Children under six, especially those going to stay with their grandparents for a few days, will enjoy the fun and love that envelops Little Bear. Without getting into any specific theology or spirituality, this charming book gives a comforting, everyday description of heaven.